Most irresistible of the bunch is “Sandman,” a blurry electric blues punctuated by lusty trills and stinging guitars. The folkloric Sandman sprinkles magic dust and brings dreams to sleeping children; in Lindsey’s deadpan falsetto, a line like, “I want it in bed / Or nothing at all,” leaves those dreams’ contents up for interpretation, but not by much. Penny Pitchlynn’s bass is wall-shaking. The combined rhythm section is enough to put you in the mood for a moral panic. 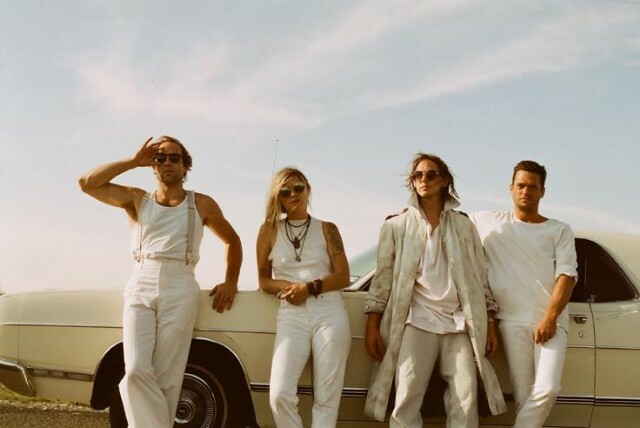 Director Pooneh Ghana’s 12-minute double video for “Sandman” and “Boys” casts the Sandman as a skeletal, chain-smoking barfly haunted by the four members of Broncho, clad in ghostly rock ‘n’ roll whites. They follow him through the streets and watch him from the screen of a motel television, cradling a pharmacist’s jar filled with psychoactive maraschino cherries. There are cherries on the new album’s cover art too, a gelatinous slurry slurped by a serpentine tongue, a sensual, spooky revival of the juiciest of rock clichés. Bad Behavior follows up 2016’s Double Vanity and comes out October 12 from Park the Van. Watch the double video for “Sandman” and “Boys Got to Go” below.